common name for the Solanaceae, a family of herbs, shrubs, and a few trees of warm regions, chiefly tropical America. Many are climbing or creeping types, and rank-smelling foliage is typical of many species. name for the larvae of many moths of the family Noctuidae (owlet moths). These larvae, or caterpillars, feed at night on the stems and roots of young plants, often cutting them off near the surface of the ground. They hide in soil by day. ..... Click the link for more information. , class Magnoliopsida, order Solanales, family Solanaceae. Be aware they are in the nightshade family. 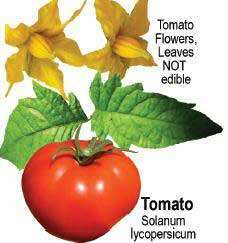 Do not eat tomato flowers or leaves. High in potassium, major source of LYCOPENE (very good for prostate), fiber, A, C, good liver and blood tonic (purifying effect). Raw they are good for us, but if they are heated, cooked or stewed (like spaghetti sauce or ketchup), they become very corrosive to the body and can even lead to colon /bowel ulcers. A plant of the genus Lycopersicon, especially L. esculentum, in the family Solanaceae cultivated for its fleshy edible fruit, which is red, pink, orange, yellow, white, or green, with fleshy placentas containing many small, oval seeds with short hairs and covered with a gelatinous matrix. 2. the fruit of this plant, which has slightly acid-tasting flesh and is eaten in salads, as a vegetable, etc. A Linux-based operating system for wireless routers that employ a Broadcom chipset. Derived from the HyperWRT operating system, Tomato offers a firmware upgrade for users who want a usage monitor, more advanced QoS settings and other features not available in the standard router. For more information, visit www.polarcloud.com/tomato. See HyperWRT, OpenWRT and DD-WRT. It features Junior Lex, who will be a special guest at the Love Apple gig. In 19th century France, the tomato was affectionately known as the love apple, or le pomme d'amour. I love Apple products, I have like 5 different stuff of theirs so I wanted to come out and check out the new store&hellip; and score myself a free shirt of course," laughed Ron Mitchells, 25, from Brooklyn, NY. Initially, only four lines are being pushed strongly in the UK -- Original Planters Spicy Piquant Sauce (184ml), Spicy Tomato Love Apple Sauce (184ml), Pukka Hot Pepper Sauce (156ml), and Spicy Jerk Sauce (156ml). Heinz Ketchup's Love Apple Pie adds just the right tint of color and a subtle sweetness to one of America's favorite and most enduring desserts -- apple pie. q SUNDAY Bradford, Love Apple MISS CLITTY RUB (comedy); Rotherham, Voodoo Cellar "The Caper Club" feat. Heinz (NYSE:HNZ) Ketchup's Love Apple Pie will be one of several recipes showcased at the H.
q Bradford, Randall Well St Car Park Love Apple presents "Bradford Big Gig" feat. The menu includes such eclectic delights as the Lurve Burger,`MonPetit Chou'(`My Little Cabbage' to you and me) and the worryingly titled Creamy Love Apple Soup. Bradford Gets Salsalicious "Salsalicious" is a new Latin night that has started up at Bradford's Love Apple.